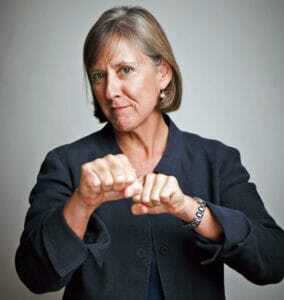 Tech venture capitalist Mary Meeker is doing all the right things in this executive headshot. Her hair is nicely styled. Her eyes and face are “open” and easy to see. The colors she is wearing on the body are flattering and make her look as trustworthy as she looks engaging. When Mary Meeker talks, many people listen. 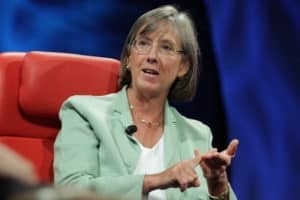 One of Silicon Valley’s most powerful Internet promoters and partner at the prestigious venture capital firm Kleiner Perkins Caufield & Byers, Mary Meeker has been bullish about tech companies for nearly twenty years. 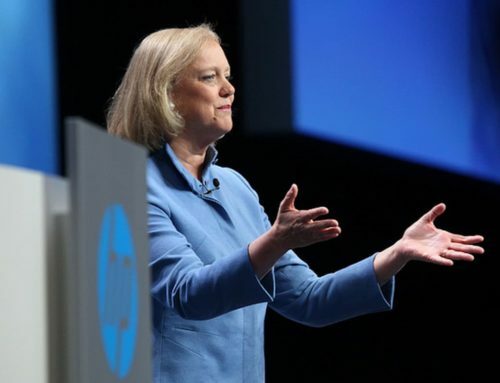 The influence she wields can hardly be described as meek. And that’s exactly why I’m interested in profiling the personal style and presence of Mary Meeker. 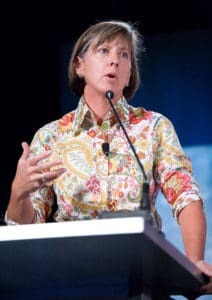 Before coming to Silicon Valley, Mary Meeker was an analyst for Morgan Stanley in New York back in the 90s. During the very dawn of the web, she began writing what has become an annual report called The Internet Report. This report initially drove a whirlwind of interest in startups like Amazon.com, Expedia, and many others, and is still highly anticipated each year by the Technorati. 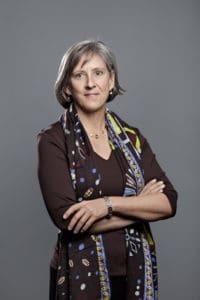 Nearly three years ago, Mary Meeker made the transition from investment banking analyst to tech venture capital partner. That meant changing geographic locations and work cultures. Just because a person packs up and moves to a new location, and to a new business, does that mean that everything about the person changes? I don’t think so! When Mary Meeker talks, people do listen. But a shirt with this much color and pattern can be visually distracting. Even if the colors are flattering, it’s not an ideal piece of clothing to wear when addressing a crowd. 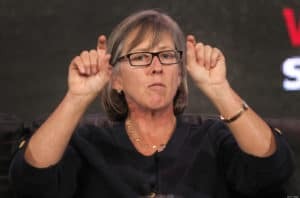 My analysis of Mary Meeker, based on evaluating her presence in several easily sourced photographs on the Internet, suggests that her past and her present influence her personal style and presence. When working with clients, I look for patterns about them that can be revealed through what they wear. Naturally, it’s also an opportunity to explore ideas to help them improve their personal style and presence. The experience always reveals different strengths and growth opportunities for each person, including Mary Meeker. Looking at Mary Meeker, I see that this mint green jacket does not serve to give her an authoritative look. This is important, because if you look at her body language and her posture, she appears to be making an authoritative point. The problems with the jacket are the color and that it is ill-fitting. Also of note are her glasses. They seem to age her. Who wants that? A very obvious shift in appearance that I notice about Mary Meeker is that she shifts between different eyewear and wearing no eyewear at all. My own personal bias may suggest that I’m a huge fan of eyewear. But, based on how she looks in the eyewear I have seen her wear, versus wearing no eyewear at all, I’d say that she looks more open and more naturally strong without eyewear. That said, I do believe that she could wear glasses very well. But I’m not convinced that what she’s been wearing is doing her any favors. The rimless glasses seem to age her. The brow of the dark glasses she wears makes her look very stern and not open like she does with no glasses on at all. This executive shot of Mary Meeker seems to show her powerful and in action. But the garment style and color fail to support these elements of her personality. This is how onlookers become confused about a person’s credibility. Two of these images are clearly professionally shot executive portraits, and the others show Mary Meeker in action at meetings or symposiums. The colors she wears in the better of the two professional shots are very nicely coordinated, are flattering, and highlight her strengths in a visual way. She looks relaxed, current, confident, and alert. I like that look so much, that I’d like to see her achieve that kind of aura anytime she is at a public event, or even just when she’s doing her own private things. The best looks always provide the wearer with the greatest energy. That she looks like her energy is depleted in dark gray, or in light green, or in too much print and color suggests that there are ways she could up her presence. It doesn’t have to be painful to achieve this stronger and more natural presence. Mary Meeker speaks during a Web 2.0 Summit. You can see that she is animated with her body language. But the line of her eyewear seems to essentially furrow her brow and makes her look angered when she may not have been. She does get points for the great necklace. It does appear that she does look powerful yet approachable and still feminine in the jackets she has bought on her own. That “power look” could be a hold over attitude from her time in New York. 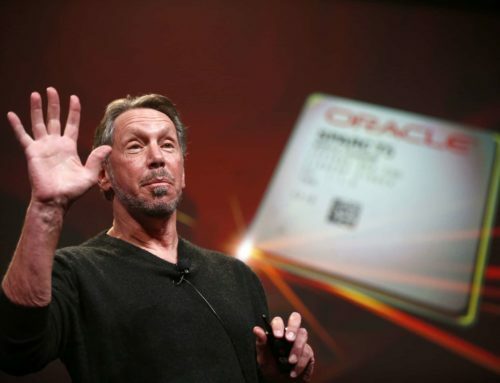 But the look of ease is something that seems to be an unwritten Silicon Valley style rule. Few if any tech, much less VCs, dress formally. So I do think that Mary Meeker scores good points for getting the attitude right. But I’m curious about which styles really match who she is from the inside out, not which styles best reflect the culture. I also do not care for how several of the garments fit. I’m positive that she gives away some of her visual authority by wearing improperly fitted clothing. Hair is often a sensitive subject for my male and female clients. When a person has fine hair, it makes it difficult to do a whole lot with it. It appears that Mary Meeker has fine hair. But an excellent cut, great styling products, and a simple regimen that she can do on her own would give her more a more consistent and polished presence. 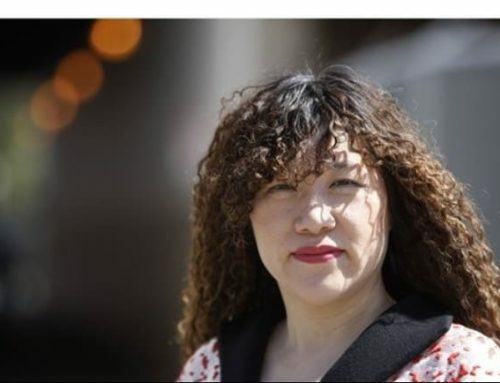 I do not think it is necessary for her to color her hair. But I do recommend that she rely on the use of color in her clothing and cosmetics to help bring out her own natural coloring. Overall, I see the strengths of Mary Meeker. But that’s my job, and it comes more easily to me. Twenty-five years of understanding people, their presence, and their styles, gives me an innate ability to see how to help people make the best of themselves. But if you don’t have the same skillset, it may be difficult to see into a person what I see. This is why it’s important for people like Mary Meeker, and maybe even you, to think about how to develop a constant and consistent visual message that leaves no one’s interpretations of your strengths to chance.